Net Effective Rent in NYC: How Is It Calculated and What Does It Mean? What Does Net Effective Rent Mean in NYC? 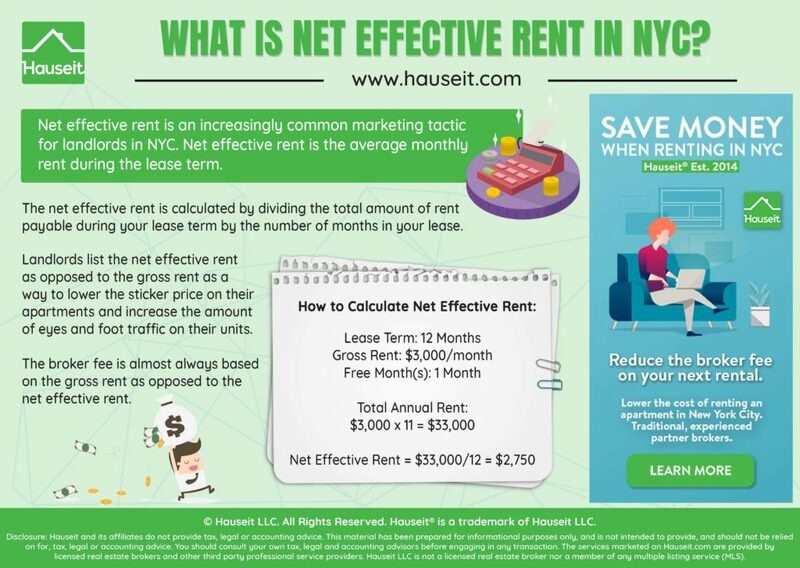 ‘Net effective rent’ is an increasingly common phrase being found on rental listings in NYC as a marketing tactic for landlords who are offering free months of rent as an incentive for tenants. Net effective rent represents the average monthly rent you pay during the term of your lease, factoring in landlord concessions (like a free month of rent). The net effective rent is calculated by dividing the total amount of rent payable during your lease term by the number of months in your lease. Landlords list the net effective rent as opposed to the gross rent as a way to lower the sticker price on their apartments and increase the amount of eyes and foot traffic on their units. 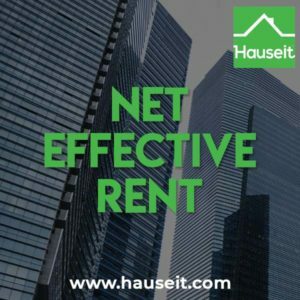 Calculate net effective rent from gross rent and estimate your total monthly rental expenses using Hauseit’s Net Effective Rent Calculator. What Does Net Effective Rent Mean? How Do I Calculate Gross Rent from Net Effective Rent? What Does One Month Free Rent Mean? Is the Broker Fee Based on Gross Rent or Net Effective Rent? Is Net Effective Rent Too Good to Be True? 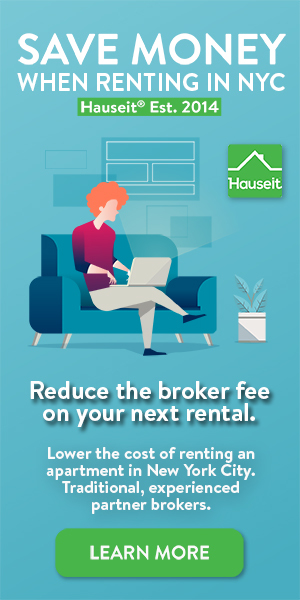 Save money on your next apartment rental in NYC by requesting a Hauseit® Rental Broker Fee Credit. Net effective rent is the average monthly rent you pay during the term of a lease. If a landlord is offering you a free month, you’d still typically pay the higher (gross) rent every month except for the month which is free. On average, the amount you pay each month is the net effective rent. Faced with high rental broker fees, many renters in NYC are understandably suspicious of ‘net effective rent’ and unsure whether or not it it’s a good deal or a gimmick. The truth about net effective rent being lower than gross rent is that it does save you money, on average, during the course of your lease. Despite the real savings on offer when net effective is lower than gross rent, many renters are still unhappy when they find out that the monthly amount of rent they must pay is usually still the gross rent except for the free month(s). In this example, you’d pay $8,500/month for 11 months and then $0 for the 12th month of the lease. The average rent you’d pay during the lease term is $7,791/month, otherwise known as the net effective rent. Here’s an easy example: if you sign a 12 month lease at $3,000/month but the last month is free, your total rent over the course of the lease is 11 x $3,000 = $33,000. Dividing $33,000 in rent over the 12 month lease term gives you a net effective rent of $2,750. Bear in mind that in our example above, you’d still need to pay $3,000/month for 11 months. In fact, you’d never actually pay $2,750/month at any point during the lease. The figure of $2,750/month is simply the average monthly rent you pay during the lease term once you’ve factored in the free month being offered by the landlord. One month of free rent means exactly that: a landlord is offering to cover one month of rent during your lease term. Free rent credits are most common in large and/or recently renovated rental buildings where a landlord has lots of available units and a strong desire to rent apartments quickly. Landlords usually prefer to sign a lease with a higher gross rent figure and offer a free month vs. simply renting the unit at the net effective rent amount without offering any rent credits. This is because a higher gross rent figure looks better from the perspective of outside lenders and investors who may be doing business with the landlord. Another way of saying this is that offering a free month of rent while maintaining a higher lease rent allows a landlord to keep the ‘gross rent’ figures on his or her rent roll higher. A landlord who is doing a cap rate analysis may be able to increase the value of a building if the gross rents are higher, since the free month(s) may not be reflected in a forward looking cash flow based valuation. The broker fee is almost always based on the gross rent as opposed to the net effective rent. This is because the lease itself will usually list the gross rent. The net effective rent never actually appears on most leases, since it’s more common to list the gross rent and just include language about the free month(s) being offered by the landlord. While you don’t need a broker to rent an apartment in NYC, most listings do have a broker fee. This means that you’d still need to pay the rental broker fee to the listing broker even if you don’t have your own tenant’s agent helping you with the search. For higher-end apartments with 15% broker fees, it’s customary for your broker and the landlord’s agent to split (or co-broke) the fee. Gross rent is the amount of rent you’d pay each month, excluding the month(s) for which the tenant has agree to cover your rent. Net effective rent is simply the average monthly amount of rent you pay over the term of the lease, factoring in the free month(s) and the other months when you’re paying the gross rent. Yes and no. The truth is that you do save money during the term of a lease if the net effective rent is lower than the gross rent. Even if you must pay the higher gross rent during the months which are not free, you are still paying less than the gross rent on average during the term of the lease. With that said, a net effective rent deal can put you in a bind when it comes time to renew your lease. This is because most landlords will base the renewal terms on the gross rent as opposed to the net effective. In other words, be prepared for a substantial rent increase if you choose to renew your lease.